At this time of year I am often seduced into buying a pineapple as they always look so exotic and cost so little for their size. I take it home and arrange it carefully in the fruit bowl where it sits being admired until it is way past it’s best. I think it’s laziness on my part as it always seems such a faff to prepare it. But I vow to change my ways and have now devised a great no-fuss way of cutting it up. Then to keep things simple I love to roast it with a few warm spices and a splash of orange and serve it warm. Any leftovers also also good eaten straight out of the fridge with a spoonful of yogurt. Heat the oven to 190C/fan 170C/Gas 5. 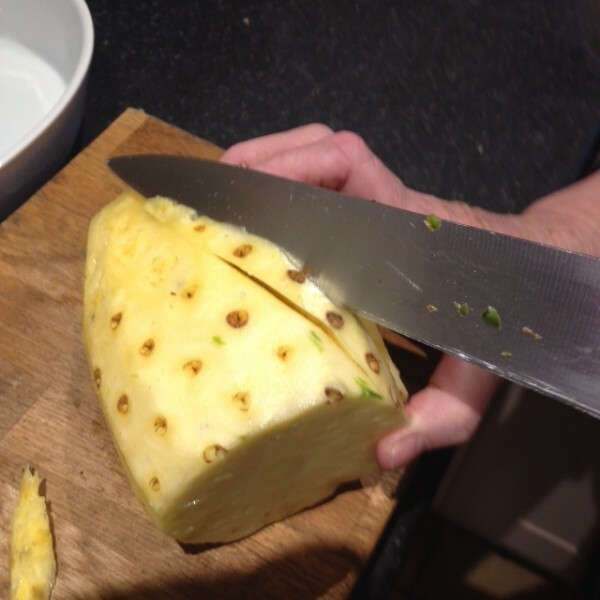 Using a large sharp knife cut the top and base from the pineapple. Stand it upright and slice down the skin all round to remove it, following the curve of the fruit..
Cut diagonal shallow v shapes from the flesh from top to bottom, following the lines of the brown eyes to remove them. 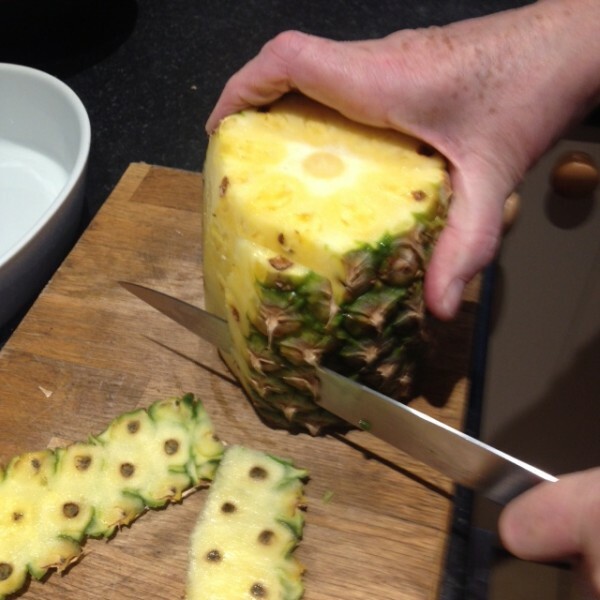 Cut the pineapple in half through the core, then into quarters the same way. 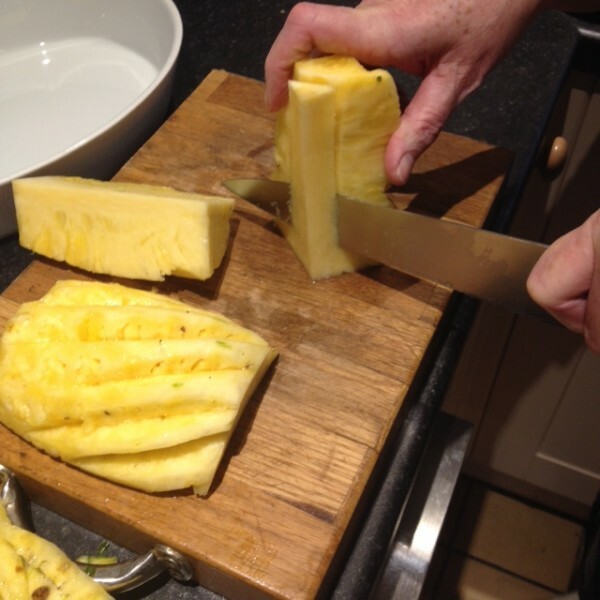 Cut the pineapple into thick slices and put in a large shallow ovenproof dish. Pare thin strips of peel from one of the oranges. 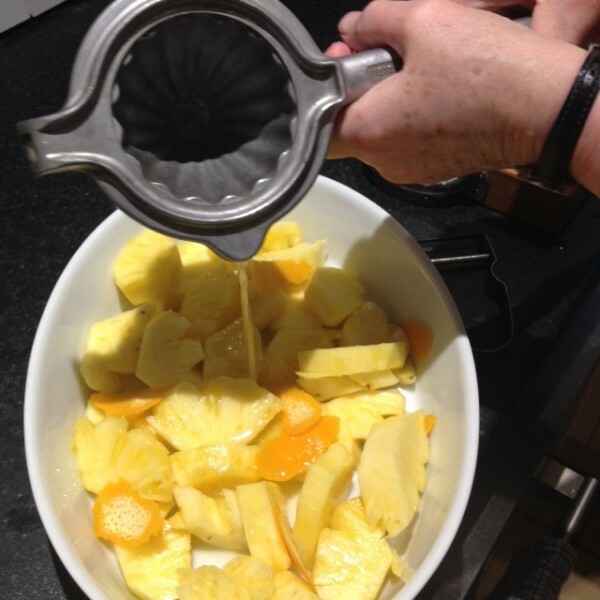 Squeeze the juice from both oranges and pour over the pineapple. 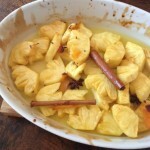 Tuck the cinnamon and star anise around the fruit and sprinkle with sugar. Bake for 20-25 mins, shaking the dish halfway through, until the fruit is tinged brown at the edges. 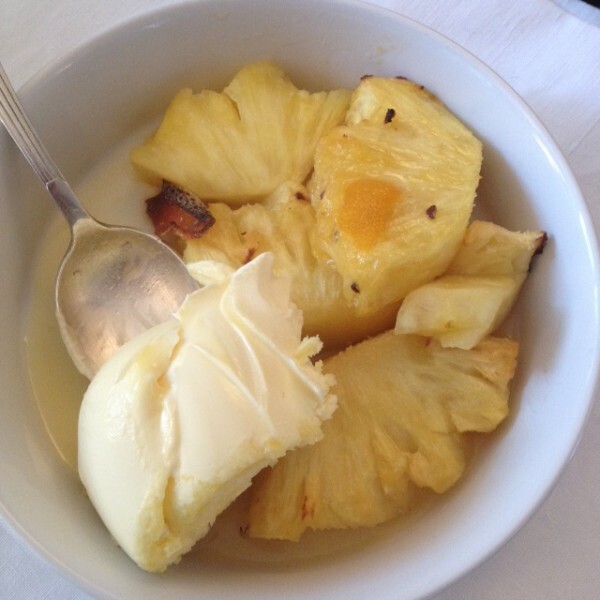 Serve warm or cold as it is or with coconut ice cream or generous spoonsful of clotted cream. 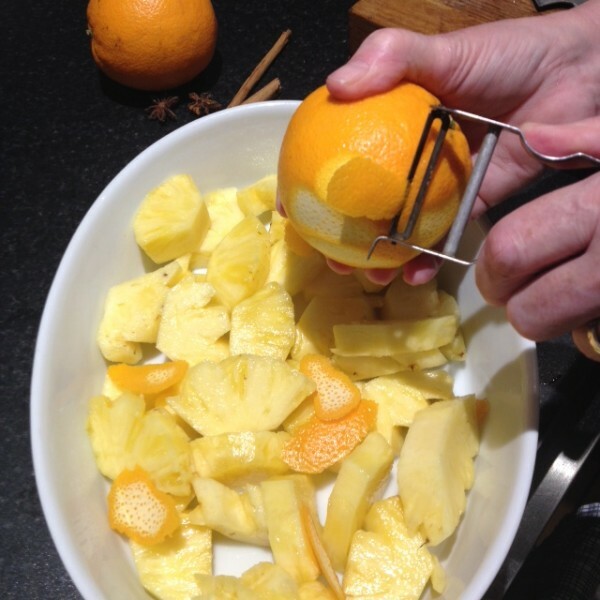 This entry was posted in Dessert and tagged exotic fruit, low fat, winter on 11th January 2016 by marycadogan.